Add this sandwich to the list of California inspired foods. I guess the avocadoes and jalapenos incorporated into the recipe make it 'Californian'? Regardless, there's no denying how good this was for lunch the other day! Sandwiched between 2 slices of buttered bread are layers of shredded Monterey Jack cheese with mixed chiles, oven roasted turkey, crisp cooked bacon, buttery avocado slices and more Monterey Jack cheese with chiles. Who can argue with that combo?! The key to making this sandwich is applying the low and slow cooking method. To get a perfectly golden brown sandwich, melted butter is brushed on the bread and cooked on a low heat in a nonstick skillet. This ensures the cheese melts perfectly and evenly. 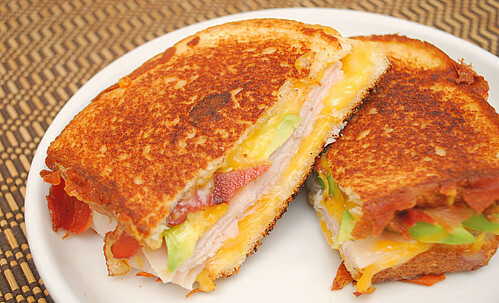 Speaking of cheese, rather than using sliced cheeses, shredded cheese is used since it melts better and often results in extra bits of cheese melted on the sides of the sandwich. Combine the cheese and minced jalepenos in a bowl, set aside. Brush the top side of each slice of bread with melted butter. Flip 4 bread slices over. Layer 1/4 cup of the jalapeno/cheese mixture, 2 slices deli turkey, 3 strips bacon, several avocado slices and another 1/4 cup jalapeno/cheese mixture into each sandwich. Cover with remaining bread slices, buttered side up. Heat a large nonstick skillet over medium low heat for 1 minute. Place 2 sandwiches in the pan and press down slightly with a large spatula. Cook until first side is golden brown. Flip sandwiches, press again with spatula and cook until golden brown. Repeat with remaining 2 sandwiches. OH my word!! This melt looks AMAZING! I would have to omit the avocados, but everything looks absolutely perfect for me! Mmm these look so tasty! I don't think I ever would have thought to do jalepenos, bacon and avocado all together but the more I think about it, it's genius! I'm gonna have to try these out! This recipe sounds delicious! The only thing I would change (for my personal preferences) is I would substitute the jalapenos with canned green chilis which add flavor with minimal heat. Thanks for posting this recipe!